Today I could share with you a sappy post about A and I's 4th wedding anniversary that we will be celebrating tomorrow. I could take you down memory lane and talk about our wedding day - from our first look, to the ceremony, and then the reception. Or, I could remind you how much fun A and I had on our honeymoon/one year anniversary in Marina, California. But I'll spare you the boring "I love you's" and bring you a fun recipe. Which, by the way, would be perfect for a 4th anniversary because it involves fruit. If you don't know what I'm talking about, check out anniversary gifts by year. Just for the heck of it, here's one photo from our wedding. 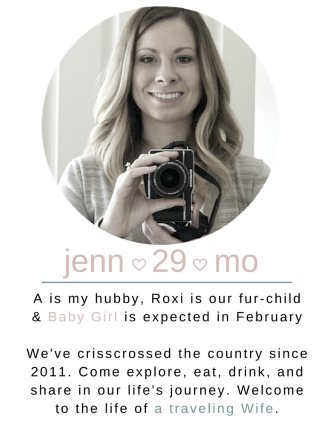 And if you really want to read all about our wedding day and anniversaries, they are linked above. You are welcome. Click to tweet: The perfect wedding anniversary dessert. How cute are these little grape poppers? We had them once at a party a couple years ago and I have been remaking them since. And since fruit/flowers are the anniversary gift for year four, I decided to make these as our little desserts to celebrate. Now don't get me wrong, you don't need to be celebrating anything to enjoy these. In fact, you don't even need to wait for dessert to eat the grape poppers. Plus some of my favorite days include reverse meals - dessert before dinner. Most everyone will have these three ingredients on hand. If you don't, what is wrong with you? Only kidding! Peanuts, grapes, and chocolate bark make an extremely delicious combination and you definitely cannot eat one. Are you convinced yet to make these? Let me share with you how easy they are to make. Then you can enjoy some grape poppers today and help A and I celebrate our anniversary. Ready?! 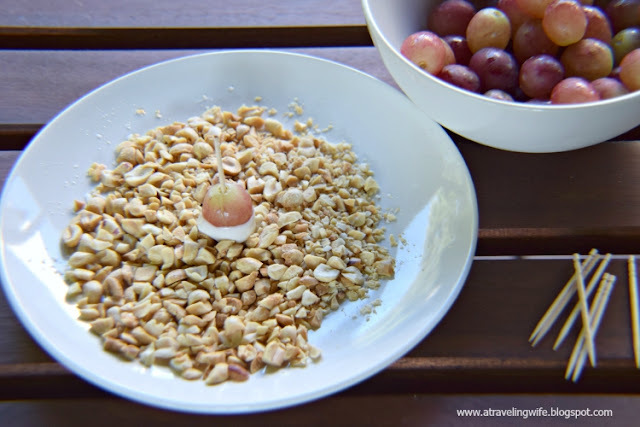 Click to tweet: The perfect snack or dessert - grape popper recipe. - Wash and thoroughly dry the grapes. You can always use a wet paper towel to hand wash the grapes. If the grapes are too wet, the chocolate will have a hard time sticking and the grapes will become soggy. - Melt chocolate according to package. Typically, a double boiler works great or microwave on high in microwavable dish for 30 seconds at a time. 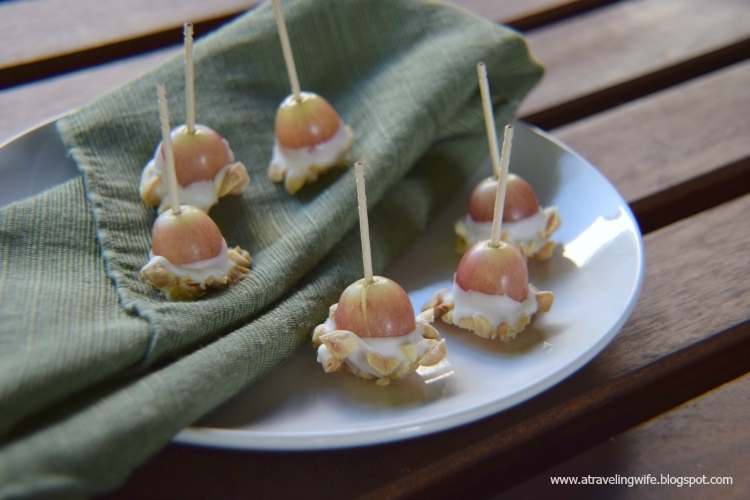 - Spear grapes with toothpick then dip halfway into melted white chocolate. 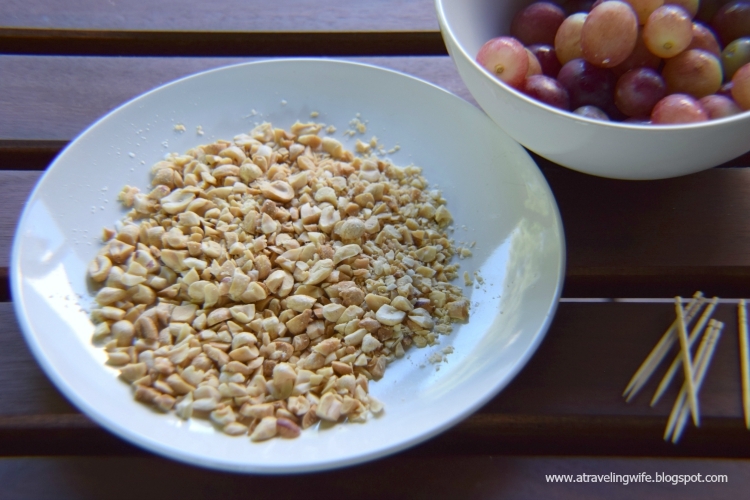 - Now place the grape into the chopped peanuts then set aside on wax paper to harden. What is your favorite dessert turned snack? What a genius idea, love it! They are very, very tasty. 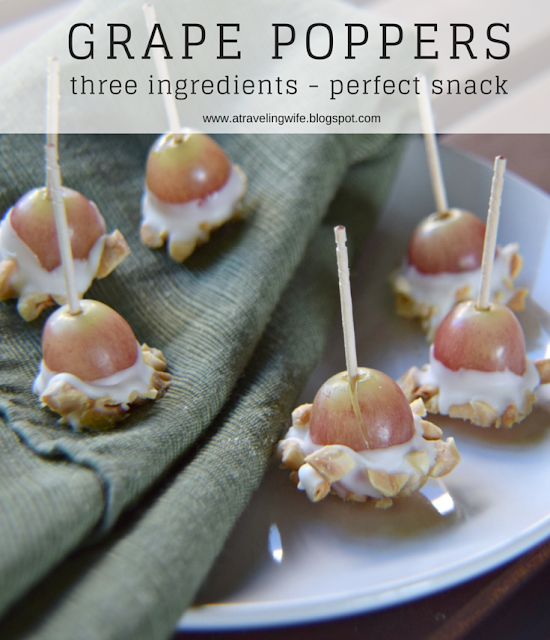 Plus the grape poppers are pretty easy to make.